Imprisoned in the void of a ruined universe by vengeful gods, Tharizdun - the Chained God, the Elder Elemental Eye - shares his exile with the Progenitor, a pool of liquid crystal that is all that remains of the Abyss that destroyed his universe. 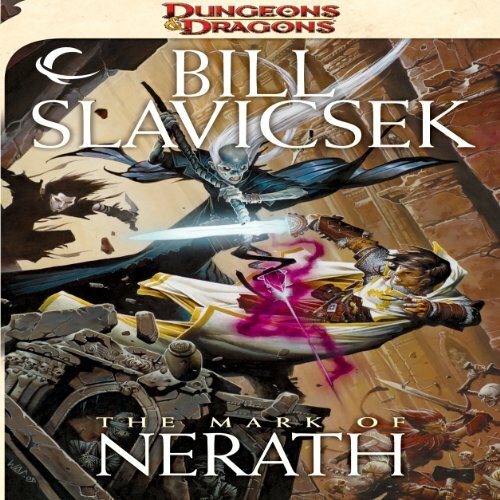 Enter our heroes Albanon, Shara and Uldane - all three adventurers readers will know from The Mark of Nerath. They thought their quests were over and done with, but danger still burns like the embers of a smoldering fire in the tall grass. The first book in a series featuring characters from the D&D core rules. Featuring the iconic characters that appeared throughout the latest edition of the D&D game, this new series will attract new players and readers to the various worlds featured in the Wizards of the Coast book-publishing line. The already familiar characters and D&D-related content will also make this series very approachable to current players. mascus awakens surrounded by corpses, at a shrine littered with traces of demonic rituals, with no memory of his past. But the Firestorm Cabal remembers him - and the demon who leads them seems to have a personal vendetta against him. Dodging knives, uncovering clues left by his past life, and dueling demons, Demascus must figure out who he is, what battles he is fighting, and who is hunting him before one of them catches up with him. The Lady has spoken to me. It has already begun. Shadows move out of the shrinking desert, south to the rich and arrogant cities of Sembia. "Be brave, little man," says the shadowman, and the boy thinks his voice is surprisingly soft. "Stay with your mother. This will be over soon." The shadows swallow him and he is gone. On the edge of a war that will change the face of Faern, the world will find that not all shadows serve Shade. Rejected at birth and raised in a village of tiefling misfits, Farideh expects a life without friends, love, or control over her destiny. Then she makes a pact with a devil named Lorcan, and everything changes. Lorcan promises all she ever dreamed of and asks for nothing in return. Her twin sister Havilar urges Farideh to resist the devil’s sway. But Farideh’s not so sure. Lorcan may be dangerous but the power he offers is exhilarating. Aric, a half-elf with a rare natural ability with the psionic discipline known as "the Way", must find his place in a world ruled by the tyranny of evil sorcerer kings, and dominated by the savage wilds of the Athasian desert, a world presided over by the unrelenting crimson eye of Dark Sun. When Aric is brought into a quest to search for a priceless trove of weapons, he would rather keep his head down and live a simple life. But nothing is simple in the city of Nibenay with its reclusive ruler known as the Shadow King. And in a world where metal is the rarest of commodities, Aric’s "way" with metal is an even rarer talent. Close to the Dark Sun, I remember. Erevis Cale - simple butler or much, much more? The shadows grow long on the mean streets of Selgaunt...and the sun sets on one man's service to Sembia's merchant lords. The day's end finds Erevis Cale serving a new master, one who is beyond the petty accumulation of wealth. After all, what is gold to one who trades in souls? Zaltys is a girl like any other to grow up ranging thejungles of the Southern Lluirwood. She’s a crack shot with a bow and no stranger to the dangers that lurk beneath the deep forest canopy. On expedition with her family to harvest the forbidden terazul flower, a powerful drug that has gathered many a dreamer into its narcotic embrace, Zaltys is about to unearth a truth long buried by the feculent loam of deception. When a wandering swordmage, trained by the elves of Myth Drannor, returns to his boyhood home on the windswept shores of the Moonsea, he finds that corruption has taken hold, leaving his friends and family open to a devastating evil.Swordmage was the first novel to fully embrace the exciting new elements from the next edition of the Dungeons & Dragons game. Rumors are swirling around the dark corners of Westgate that a brutal vigilante is dealing violence and havoc in the guise of Shadowbane. Kalen and Myrin have just arrived from Luskan, in search of Kalen's former apprentice, Rhett. Though Kalen believes Rhett to be dead, Myrin won't give up hope as she in turn seeks more information about her past. And Kalen too must find his place, perhaps in the Eye of Justice - the organization that trained him - though that's the last place he wants to end up. But who are is this mysterious vigilante who wields the vaunted sword Vindicator? 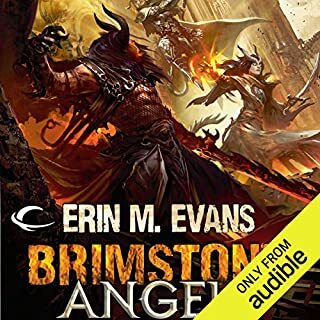 For elven pathfinder Varian Jeggare and his devil-blooded assistant Radovan, things are rarely as they seem. 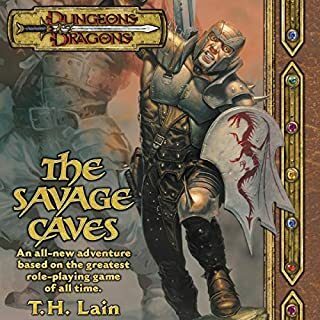 Yet not even the notorious crime-solving duo is prepared for what they find when a search for a missing pathfinder takes them into the mist-shrouded mountains of gothic Ustalav. Like the tabletop RPG Adventure I always wanted. Take flight with the Brotherhood of the Griffin - Richard Lee Byers’s most celebrated characters. The Captive Flame features the return of popular character Aoth and his mercenary band, the Brotherhood of the Griffin, introduced in Richard Lee Byers' trilogy The Haunted Lands. Byers's signature twisted plots make this a must-have for all true Forgotten Realms fans. Aoth and his band of mercenaries, the Brotherhood of the Griffin, are hired to put a stop to a disturbing series of ritualistic killings. Renegade dragon hunter Dorn hates dragons with a passion few can believe, let alone match. He has devoted his entire life - a life spent in the twisted body of a half-golem - to killing every dragon he can find. You might feel the same way if one of them had killed your entire family in front of your eyes, bitten you in half, and left you for dead. Killing one dragon at a time is hard enough, but when the irresistible impluse to slip into feral madness begins to overcome not one but every dragon all across Faern, civilization's only hope may lie in the last alliance Dorn and his fellow dragon hunters would ever accept. About a century ago, the collapse of Nerath, the last empire of the world, ushered in a dark age that continues to this day, the peace and prosperity of the past seemingly lost forever. However, even those fabled days weren’t without a few blemishes. One of these was Emperor Magroth the First, a tyrant and a conqueror; cruel, ambitious, filled with delusions of grandeur and dreams of destiny, and more than a bit insane. During Magroth’s reign, rumors of necromancy and demon worship were rampant, but the truth was far worse. Thanks to deals he made, pacts he agreed to, and rituals he performed, death was not the end Emperor Magroth. Instead, a piece of him was drawn into the Shadowfell where he became the ruler of a domain of dead. From this vantage, the old king prepared for his return - and the new empire he would forge from the ruins of old. Now Magroth has made a new deal with Orcus, the Demon Prince of Undeath, that frees him from his eternal prison for a year and a day. In that time, Magroth must re-establish his ancient kingdom while also accomplishing a series of terrible tasks for Orcus. To this end, Magroth’s plans intersect with two other threats that are rising in the world. Where these threats meet, the world shudders. And it falls to our heroes to keep the fragile lights of civilization burning for another day. 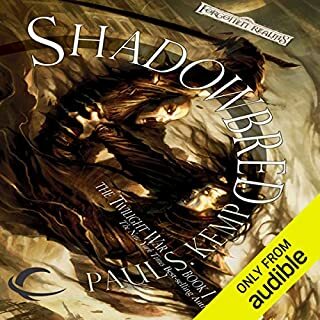 ©2010 Wizards of the Coast LLC (P)2013 Audible, Inc. This book has gotten poor reviews because it has been judged against wrong criteria. This book introduces the Nentir Vale sandbox setting of D&D 4e. It's many locations are there for the reader to later get the game products about them. It is written as a way of showing how to To answer just how a game spell would work in a narrative fiction setting it mentions prepared spells, and fighter stances, cleric and paladin powers coming through their symbols and so on. Dialogue which seems cheesy is clearly meant to mentally see it more how a comic book does it. - like how Spidy and Doc Oc trade insults and explain plans as they fight. I found the brief reintroduction of characters in a scene each chapter a GOOD thing since there are so many characters and factions. It reads like a well written explanation of a tabletop groups campaign because that is its intention. Read it in that light and you may enjoy it as I did. Way too many characters, none of them likable. Just like the 4th edition D&D this book is based on, it's pure garbage. 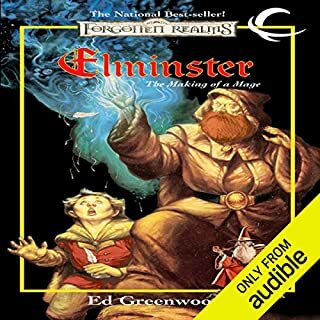 This is the first D and D audiobook I have tried, and I really wanted to like it. I've been reading fantasy for years, and like the setting. I'm also a fan of the game on which this book is based. 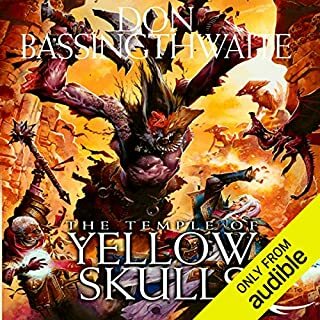 My overwhelming impression of this audiobook is that the narrator was not well chosen. The voices are both under and over-done, with one of the main characters sounding like something out of Monty Python. 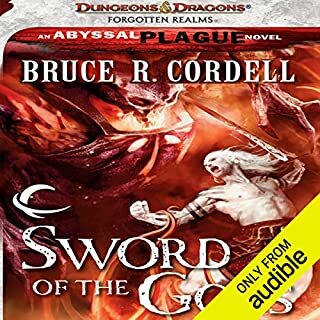 In all the years I've been listening to books through Audible, I have rarely found listening to anything to be a chore, but this certainly was. If I were to read the paper version of this book, it would be fine, but the narration killed it for me. Hate to be critical, but being honest, I've looked up other work by the same narrator, so that I can avoid it. I'm not paying for anything else by him.